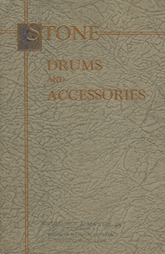 Simply put, drum catalogs are an ephemeral form of advertising material. Small trade publications such as these were entirely disposable after a very short period of use. As soon as a new catalog was issued, the old one was irrelevant. Little thought was put into what would happen to these bound sheets of paper once their short term purpose had been fulfilled. 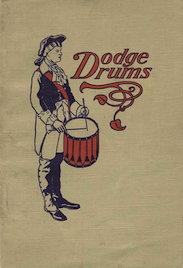 But for those who collect and study antique drums and the now defunct companies that produced them, one hundred year old drum catalogs are a priceless treasure trove of information about long gone manufacturers and their wares. 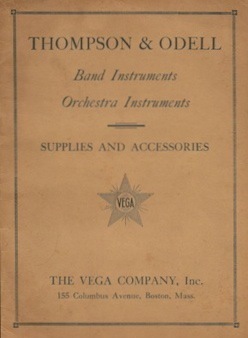 The catalogs pictured below from John C. Haynes, F. E. Dodge, Thompson & Odell, Nokes & Nicolai, Oliver Ditson, and George B. 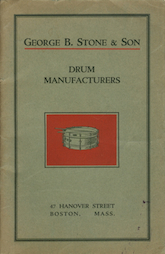 Stone & Son depict a fairly broad view of drum making in Boston from the late 19th century up through the mid 1920s. And though all of these companies would in one way or another cease operation fairly soon after this time, the evolution of the snare drum can quite literally be be traced through the pages of these trade publications. Over a period of nearly 50 years, the snare drum morphed from an old fashioned, rope tensioned instrument during the mid 1800s, to a primitive single tension thumbrod style drum around the turn of the 20th century, and finally to an all but modern showpiece by the mid 1920s where finely crafted wooden and metal shell drums featured fully functioning snare throw-offs and separate tension lugs which allowed for either head to be tuned independently. The Boston Drum Builders were at the same time experimental yet generally slow to evolve. The offerings pictured throughout these pages allow us to compare and contrast the instruments made in Boston with those of their Midwestern counterparts. In particular, Leedy of Indianapolis and Ludwig & Ludwig of Chicago were quicker to modernize and faster to grow allowing them to swiftly overtake the Boston makers in terms of size and influence. The relative scarcity of ephemera left behind by the Boston companies as compared to their peers is evidence of this trend. 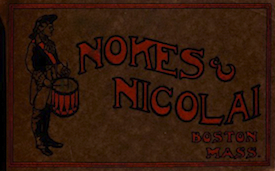 The catalog cover photos shown below are a far from comprehensive depiction of the advertisements published by the Boston Drum Builders. Surely, many other trade publications exist. Stone published "Booklet L" sometime after Catalog K and presumably had printed something resembling Catalogs "A" through "F" before arriving at "G" sometime around 1912. It would be a logical assumption that some form of catalog preceded Nokes & Nicolai's "American Drummer No. 5". Perhaps Nos. 1 through 4 were printed earlier, or maybe picking up with number five indicates that F. E. Dodge had already issued four full catalogs before Nokes & Nicolai succeeded them in 1912. 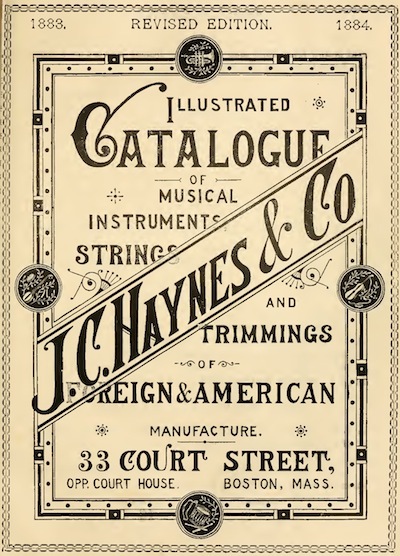 Many more J. C. Haynes & Company catalogs are known to have been published, mostly dating from the 1880s and 1890s and including a plethora of musical instruments, not just drums. The same is likely the case for Oliver Ditson whose "Wonderbook Number Four" (1910) corresponds with the volume number within a given year of publication rather than an issue in a chronological series. The two more prominent boutique builders in Boston during the early 1900s, Harry A. Bower and Charles A. Stromberg, bear mention here as well though there are no catalogs to show. Neither maker left much behind in the way of advertising as compared to the other Boston makers. 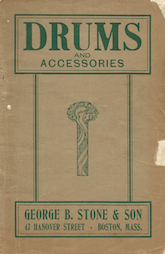 Some Bower advertising does appear in trade publications, but no full size drum catalogs by either Stromberg or Bower are known to exist. Stromberg appears to have hardly advertised his drums at all, perhaps because he was such a small, high end maker working with a broad diversity of instruments including harps, banjos, and finally guitars for which he would ultimately become best known. Some of these catalogs are viewable online in part or in their entirety. The 1907 F. E. Dodge Catalog and Geo. B. 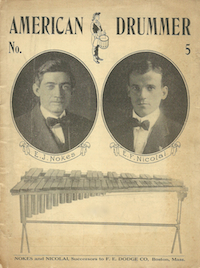 Stone & Son Catalog K (1925) can be found at VintageDrumGuide.com. The 1883 J. C. Haynes Catalog, held by the Winterthur Museum Library in Wilmington, Delaware is viewable online at the Internet Archive. The remaining catalogs included here are from the authors collection. 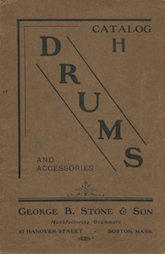 Do you have a catalog from one of Boston's early 20th century drum makers? I would love to hear from you! Feel free to send Lee an email anytime at lee@vinson.net. 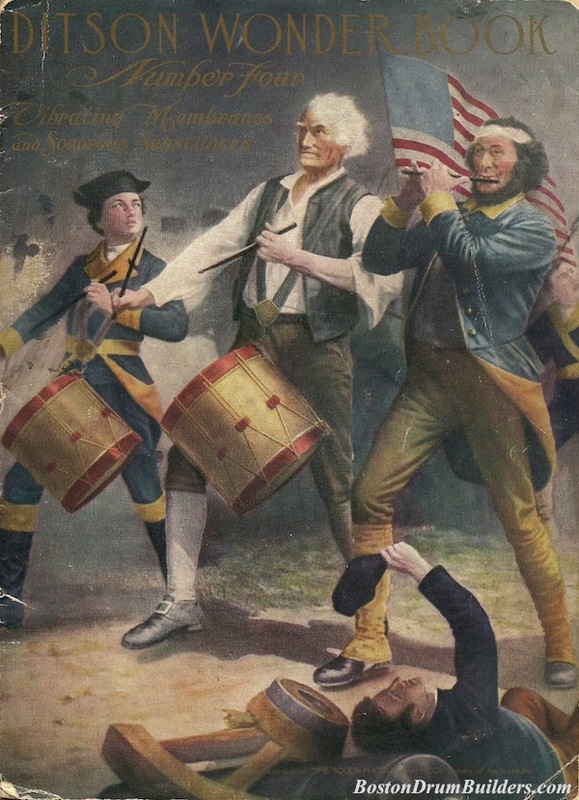 And for more on the history of drum manufacturing in Boston, Massachusetts please visit BostonDrumBuilders.com.